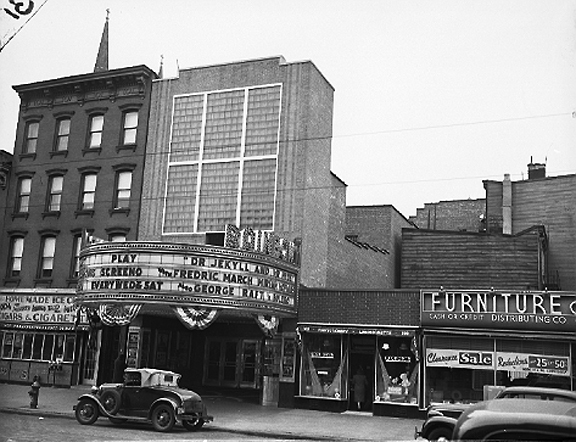 This was what the entrance to the Rainbow Theatre on Graham Avenue looked like in 1939. According to Brownstoner, the building is in mid-gut as part of a condo conversion. The 1,746-seat house of the theatre was back along Meserole Street. Like many movie houses of the day, the public face of the establishment was a small structure with a big presence on a prominent retail strip. The house was on a side street, where real estate was presumably cheaper. One wonders whether the Rainbow was a conversion of older residential structure such as that seen to the left of the theatre. Based on historic maps (which show a 4-story brick store and tenement at this location as late as 1929), that would seem to be the case.